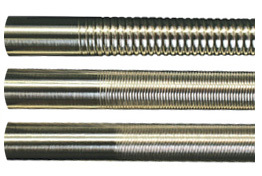 A formed rod is machined from a solid steel rod and closely resembles a wire-wound rod. Providing extremely precise metered coatings on film, tin, rubber, boards, plastics, glass, textiles and more. Little change to overall dia. Listed below are the available diameters of Standard Formed Lab Rods which are 16" overall in length allowing for 12" of effective path.